"That night, the balls were more crowded than ever; hilarious laughter all but drowned the louder music; one grew hot in the chahut, a fairly unequivocal dance, and gulped all kinds of ices and other cold drinks--when suddenly the merriest of the harlequins felt a chill in his legs, took off his mask, and to the amazement of all revealed a violet-blue face. It was soon discovered that this was no joke; the laughter died, and several wagon loads were driven directly from the ball to the Hotel-Dieu, the main hospital, where they arrived in their gaudy fancy dress and promptly died, too...[T]hose dead were said to have been buried so fast that not even their checkered fool's clothes were taken off them; and merrily as they lived they now lie in their graves. Rethel depicts the scene as he envisioned it. Death plays its instrument with a human bone, the costumed dancers struck dead mid dance at Death's feet. 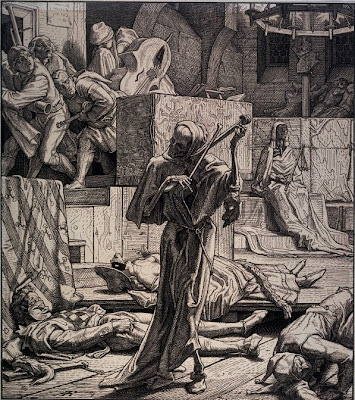 We see disease symbolized as a shrouded female figure sitting in the background, while musicians scurry from the scene with terror in their eyes. 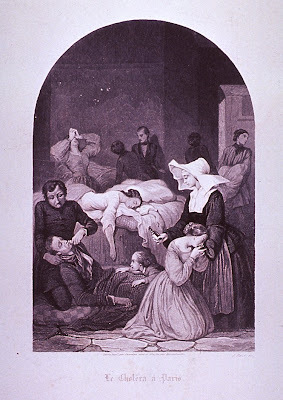 Contrast this with an illustration from the US National Library of Medicine, a picture done by J. Roze entitled "Le Cholera a Paris". This engraving also depicts the cholera epidemic, but from a different perspective. Which of the two stands out to you? One is more a symbolic representation, one more of a reality. One depicts terror, the other grief. Does either piece of art allow the viewer to experience the experiences of a sudden epidemic, or do Henrich Heine's words give a clearer picture? this looks like good inspiration for Poe's "Masque of the Red Death"! Franz Schubert "Death and the Maiden"
The views expressed on this blog are solely the opinions of its contributors. They in no way reflect the views of our employers or any other institutions with which we are affiliated. Nothing on this blog is meant to be taken as medical or any other type of professional advice. We do not host any of our own videos on this site. We do utilize already posted videos and we do post photos, quotes, and lyrics. If you have any questions or concerns about any of the material posted, please contact us. If you have the copyright on any of the material posted and object to it being used, we would be happy to take it down from our site or give proper credit.